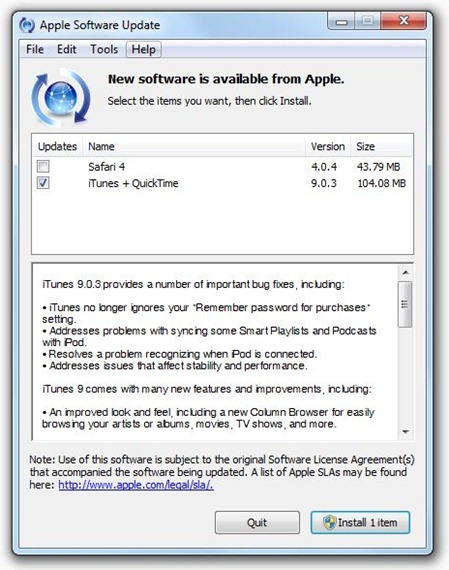 Apple has just announced the availability of iTunes 9.0.3 for both Windows and Mac. This looks more like a stability and bug fix release which addresses issues like “problems when syncing some Smart Playlists and Podcasts with iPod” and various other bug fixes. iTunes no longer ignores your “Remember password for purchases” setting. Addresses problems with syncing some Smart Playlists and Podcasts with iPod. Resolves a problem recognizing when iPod is connected. Note for Jailbreakers: Those of you who are using jailbroken iPhone and iPod touch can safely upgrade to iTunes 9.0.3 without having to worry about bricking your iPhone. You can follow me on twitter or join our facebook fanpage to keep yourself updated on all the latest iPhone software releases. Hey! After upgrading my iTunes to 9.0.3 it crashed 2 iPhones! The iPhones just stopped working, these were jailbroken iPhones. I have since been tryin to get them working again in vain! hi i m from india i bought an iphone 3gs 32 gb. it had 3.1.2 version and after few days i update it with new 3.1.3 version aftr updation it locked. pls help me in unlock that i m very thank ful to u. pls help. i m waiting for ur mail..
After installing to Windows Vista for Home, I found all sorts of bugs. The screen will neither maximize nor recognize any cursor/mouse activity (can't click on anything). I've uninstalled and reinstalled several times. No difference. I loved iTunes, but fear they may have broken it real good this time. Is upgrading itunes to 9.1 going to affect the ipod after I jailbreak it? whats the newest itunes that won't kill my jailbreak?